Home Christmas Online Extravaganza Starts TODAY!! 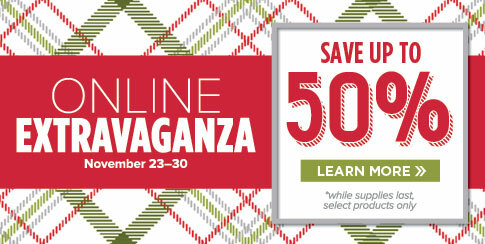 Stampin’ Up!’s Online Extravaganza Starts today and goes until November 30th! So stock up on your favorite Crafting items for your Family and Friends. Or just for yourself. After all you deserve a little Holiday Present too! Ready to order? You can place an order HERE. If you order is under $150 use the Hostess Code 2CATZWT3 and I will share a ribbon sampler with you! I love to share hostess benefits with you! Of course if your order is over $150, collect the hostess benefits for yourself and Enjoy!